Peter Jackson’s ill-advised and transparently greedy three-part adaptation of J.R.R. 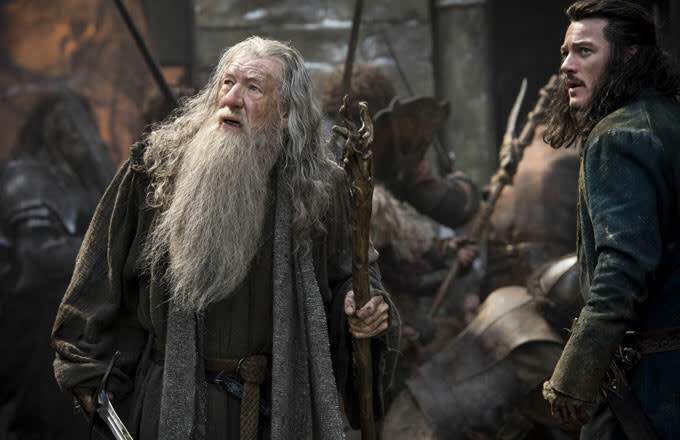 Tolkien’s one-part The Hobbit sputters to a conclusion in The Battle of the Five Armies. This cacophonous and half-hearted sequel bears the distinction of being the shortest of the lot (only 144 minutes!) and contains the least amount of plot by volume. The meat of the story has already been told; all that&apos;s left now is the third-act battle and the tying up of threads whose beginnings we may well have forgotten. The Battle of the Five Armies (bet you can&apos;t name them) begins right where The Desolation of Smaug ended, with Smaug the dragon (voiced by Benedict Cumberbatch) about to unleash hell on the lakeside town where Bard the Bowman (Luke Evans) lives. That cliffhanger is resolved and the dragon is defeated before this chapter&apos;s title even appears on the screen. Someone interested in telling a good story would have put the conclusion to Smaug&apos;s story where it belongs, at the end of Smaug&apos;s movie. But someone interested in telling a good story in the first place wouldn&apos;t have stretched one book... Never mind. I&apos;m tired of saying it and you&apos;re tired of hearing it. With Smaug out of the way, attention turns to his mountain full of gold. The noble Thorin Oakenshield (Richard Armitage) and his crew of interchangeable dwarves are in there now, looking for a special jewel called the Heart of the Mountain, which does something important that I don&apos;t remember and which Bilbo (Martin Freeman) has secretly already found. In the process of searching, Thorin is overcome by the feelings of greed that the treasure inspires, claims it for himself, and takes his reluctant dwarves to the brink of war to protect it. The elves, under the direction of Lee Pace riding a majestic moose, are heading for the mountain with an army. There are also a couple armies&apos; worth of Orcs coming this way. Meanwhile, Gandalf (Ian McKellen) is locked in a birdcage suspended over a cliff, useless as ever. In other news, the forbidden romance between dwarf Kili (Aidan Turner) and non-canonical elf Tauriel (Evangeline Lilly) remains forbidden. Cate Blanchett, typically radiant as Galadriel, gets to say "You have no power here, servant of Mordor!" to somebody. And there&apos;s an irritating, unfunny comic relief character named Alfrid (Ryan Gage), a cowardly, unibrowed stooge who&apos;s dressed in drag most of the time. Jackson and his writers (Fran Walsh, Philippa Boyens, and Guillermo del Toro) created Alfrid, so they alone shall be judged when the time of reckoning comes. Yes, yes, Legolas (Orlando Bloom) is here, too, being pouty. I also jotted down the words "goblin mercenaries," so I guess there are goblin mercenaries? What plagued the first two films—having a surplus of characters but a dearth of characterization—is an even more glaring problem now that we&apos;re watching them duke it out without any context. "Who are these people and why are they fighting?" is the sort of thing you might find yourself wondering. The spectacular battles that thrilled us in Lord of the Rings did so at least in part because of our connection to the characters. Without that element, it&apos;s just a lot of pointless mayhem. It would be easy to forget that this whole thing began with Bilbo accompanying the dwarves on an adventure, given how little attention is paid to his relationship with them. In the end he bids them farewell as a group, not individually, which makes me suspect he doesn&apos;t know their names, either. It seems likely that a single three-hour film could be culled from all of this material, and that it could be wonderfully exciting, if still rather thin on character. We&apos;ll leave that to the people who make fan cuts. The rest of us should treat ourselves to a Lord of the Rings marathon and try to forget the disappointment of this misbegotten prequel. Eric Snider is a contributing writer and film critic. He&apos;s got jokes.